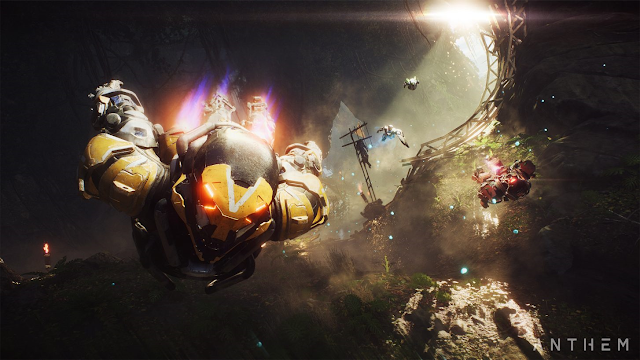 BioWare's Anthem is The Big New Thing. There seems to be absolutely no doubt in anyone's mind about that. I foresee finding myself in a very familiar position: reading thousands of words about a video game I have no interest whatsoever in playing. I predict there will be a torrent of posts, varying from the gushing to the gutted. Some will skate across the surface on a wave of feels; others will dive into the depths, dragging up a deadweight of extraordinary detail. After a couple of weeks the torrent will turn to a stream then a trickle. In six weeks only a couple of die-hards will be left, working the pump-handle for those last few drops. Everyone else will either have moved on to the Next Big New Thing, if there is one, or back to an Old Favorite. Either that or they'll be posting about how bored they are and why doesn't anyone make any good games any more? The game's not even out yet and already the dam is breached. There are leaks springing up all over the place. I've already heard plenty about the Demo Weekend and its issues. Isey and Gevlon had a sparky little interchange about that. The post that prompted me to join in, however, was Alli Rense's compelling anti-Anthem rant at The Parent Trope, unequivocally entitled Anthem? No Thank You. Alli isn't just uninterested in playing the game, like me; she sees it as an active threat to the future of the kind of games she enjoys. Very specifically she imagines that if Anthem is successful it will lead to future BioWare games following the Anthem model and abandoning the narrative RPG format on which they built their brand. She's probably right, too, although she doesn't speculate on what might become of BioWare if Anthem isn't successful. Hard to imagine that would have a positive outcome for the company or its future projects - if any. I don't have any emotional attachment to BioWare, either past or present. They made one game I really liked - Baldur's Gate - and one I quite liked - Baldur's Gate 2. That was twenty years ago. Since then they've made nothing I care about at all. I did try the first Dragon Age and found that, while it had a powerful impact at first, it very rapidly became tedious, repetitive and obvious. I played DA intensely for about a week and then one day I couldn't stand the thought of ever playing it again. It was a useful learning experience. The most important thing I learned was that I really, really hate the "Companion" mechanic, where the player character is expected to schmooze, romance or otherwise jolly along various NPCs, either by buttering them up with flattery or giving them gifts. Who ever thought this was a good idea? And how old were they? Six? Will you be my best friend if I give you my Action Figure? No, cos I can't be your friend any more, cos you like Jimmy and Jimmy's bad! Geez. Give me a break. That experience beyond anything else is why I have yet to even download Star Wars: the Old Republic. The mere thought of having to deal with managing the imaginary emotions of a bunch of virtual pre-schoolers in battle-armor gives me the heebie-jeebies. The other lesson I learned from Dragon Age is that I really can't take any more Generic Fantasy Plots (or Generic Science Fiction Plots for that matter). I can stomach them as background in MMORPGs, where all narrative is set dressing for the main performance - building my character - and I can get on board when narrative provides atmosphere for enjoyable mechanics, as in the two Baldur's Gate games or Pillars of Eternity, but the last time I encountered a plot in a video game that I found as immersive or compelling as a good novel or movie...well, if it ever happens, I'll let you know. When Alli says "I think video games are the best way we have to tell a story. Better than TV, film, and even books. Because they’re the most immersive, they have the biggest impact." I imagine she speaks for quite a few people who might be reading this. Even I would say that the medium has the potential to compete on equal terms with established narrative forms. It's potential that's gone largely unfulfilled for decades, though, primarily because of the mechanics involved. I have a big issue with all video game mechanics when it comes to storytelling. Video games are clunky. They persistently pull you out of the moment to fight things or solve puzzles or click through dialog trees. It's the equivalent of trying to watch a movie with someone sitting next to you going "Who's that guy? Wasn't he in that movie we saw last week? Are you sure you switched the lights off when we parked? Can you hold my Coke, I want to get a mint out my pocket...no, wait, your pocket. You had the mints, didn't you?" The ones that do it the least and which probably make the best stab at telling an uninterrupted narrative come from the sub-genre often somewhat derisively labelled "Walking Simulators" but what those mostly seem to me to be doing is trying to edge as close as possible to being movies. One of the main criticisms often levelled at them is that they aren't really video games at all. We do all make some sweeping assumptions at times, about what a video game can or can't be - or should or shouldn't be. At one point, in a piece that has enough comment hooks to hang a dozen blog posts on, Alli asks "Aren’t video games supposed to be an introverted hobby?". Are they? I don't know. They certainly have had that image at times, particularly in the eyes of worried parents or politicians in search of a headline. I did think the image of video games as the exclusive province of the socially maladjusted was behind us but it does recur disturbingly regularly, even now. 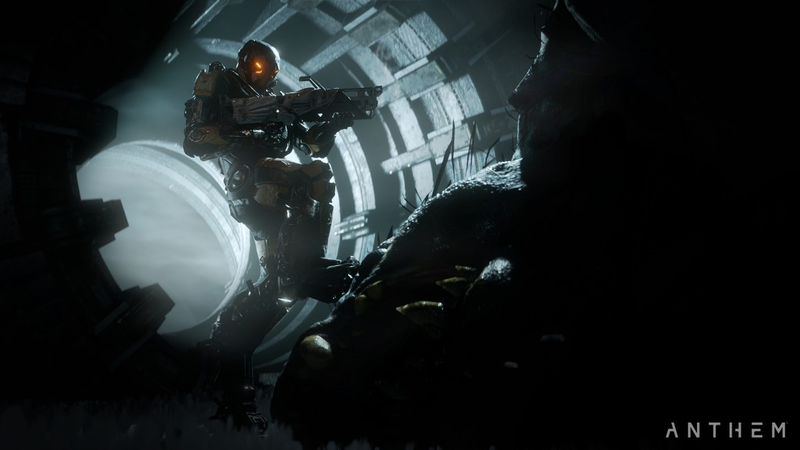 Getting back to Anthem itself, while I don't feel as disturbed by the prospect of its success as Alli, I do see it as not so much a straw in the wind but a bloody great haystack in a hurricane barrelling towards the traditional MMORPG. Belghast said something very revealing in his recent post on returning to FFXIV: "I am trying to get back into playing an MMORPG again… but it just feels weird considering how much of the Destiny style MMO Lite I have been playing of late." Pete S in reply to Belghast clarified that feeling with some solid reasoning: "I’m really struggling to engage for that same “been playing quasi-MMOs too much” reason. I just feel like the time-invest:reward ratio is off now." Pacing in MMORPGs is something many of us have been talking about and around for years. People have argued that leveling is too fast, too slow, too uneven; gear ladders have been both too long and too short. The genre suffered years of post-WoW speeding up that then slewed into a "Slow MMO" car-crash that threatened to bring the entire crowdfunding process into disrepute. While all that was going on deep in The Niche, the hinterlands were filling up with somewhat successful hybrids like Destiny and The Division and bona-fide hits and mega-hits like PUBG and Fortnite. If the last five years have told us anything, it's that there's a huge market for Massive Online Games - provided you don't add those fatal three missing letters. So I can see why Alli is worried. The current trend in large-scale online games, supported by sales, would seem to have little to do with either narrative storytelling or traditional rpg character-building. What's more, I would contend that, with Destiny, Warframe and now Anthem all choosing to house the player character in form-fitting, personality-occluding body armor, the current version of "character building" has closer affinities to driving games than to any imagined ancestry in Dungeons and Dragons. Beyond any other reason, that was why I lost interest so fast in Warframe and it's very high on the list of things that put me off trying Anthem: I don't mind my character owning and driving a vehicle but I draw the line at them being one. But no-one cares what I think because not every game has to be for me. Anthem will be a success. Possibly not as big a success as it needs to be but there or thereabouts. The trend of narrative-light, combat-heavy, fast-paced MMOs set in open worlds or open maps, using or at least including Battle Royale and Survival mechanics is going to be with us for a good while yet. There's certainly an argument that BioWare is moving away from narrative RPGs. Sure. 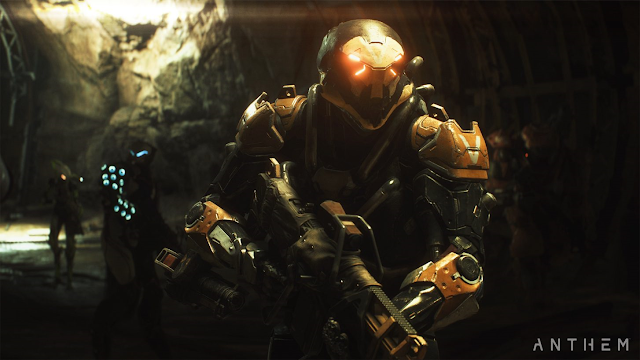 If Anthem does achieve anything, it will be about mainstreaming persistent coop shooters (which is too dismissive of Warframe's serious success for an indie). I don't think single-player narrative RPG fans have any cause for concern. It's people who expect strong, linear narrative and regular storyline content drops in MMORPGs who are going to have to start getting used to thin gruel. Or go play FFXIV, I guess. You mention breath of the wild. Can you clarify what makes this a story-driven game to you? Because my impression was quite the opposite, that it was very light on story, with a lot of the world feeling somewhat empty. It had an interesting style to me, but that was more due to this emptiness and due to the *absence* of any overarching story that takes more than an afternoon to finish for dedicated players, and more than a few shortish evening sessions for me. I was big on the original Baldur's Gate, and recall playing the sequel as well back in the day. But it is one of those things that, over time, I have been less and less of a BioWare fan... if I ever was one in the first place. I don't think just liking BG makes you a fan. Certainly part of the problem with SWTOR for me was the response wheel and the dark/light points system. But I've mentioned that I don't like the game putting words in my characters mouth before. So Anthem hasn't had any traction with me. I'm still pottering around in the same old games, most of which are at least a decade old at this point. I think RimWorld is the only recent game I have been playing lately. I did enjoy Pillars of Eternity when I played it last year. It's extremely similar to the original Baldur's Gate and I found that formula still worked. Even so, I drifted away long before I got anywhere close to finishing it. If the narrative was really the driver - and if it was any good - I wouldn't have stopped until I reached the end, but as with Baldur's Gate I never really gave much of a thought to the plot - I just liked the characters and the combat. I'm of the fairly firm opinion that the more a video game gets you to *do* the less immersed you become in the plot. The extreme opposite end of that curve might be FFXIV, with its warnings that you need to free up an hour just to watch cut scenes: that's basically telling you to stop playing a game and start watching a movie and they do it because they know if you have a long, complicated narrative it's going to require the audience's full attention, which isn't going to sit well with a lot of dodge-rolls and key-hammering. I've come to the realization that I am okay with the "live development" model. Where there is limited (but good) content to start and a trickle of content that begins almost immediately, and then is consistent and frequent (but not overwhelming). I did struggle with that at first but now it gives me what I actually enjoy about gaming - options to enjoy more and different titles. For example, I have been in and out of BAttlefield 5 since launch. They add new things every month, and new weekly style challenges. I can get the weekly challenges done in a day or two, which leaves another 5 to 6 days to play other games (without feeling like I missed out on the shinies). In MMO terms, this would be like launching a new MMO with 20 levels, then adding another 10 every 2-3 months. You just need good enough gameplay to keep the diehards still going between level adds with repetitive content, and the rest of us can play and go elsewhere and come back when there is reason. It's like an expansion cycle, just more frequent. This also allows companies to not have to go "all in" on dev costs and develop as they go, adjusting if things do not work well and focusing on the things that do. I don't think Anthem will hit 6M users like they want. That's an unfair assumption in a sea of amazing games right now. But if they grow it correctly, it might get there someday. Which was kind of point before - not to accept broken or buggy products, but accept that games are always growing, changing and iterating and to embrace that cycle. I finally came to peace with it. Anthem will be an interesting study in it for me. There's a vast gulf between "buggy, unplayable mess" and "not feature-complete". If I'm interested in playing a specific game at all, then both as a player and a consumer I would much rather get my hands on an unfinished, functional build that's fun to play than rather than wait for a supposedly "finished" package. I can see both your side and Gevlon's - the analogies he draws with other types of consumer products are telling - but in the end video games are not cars. The real clincher for me, though, is whether the game as it stands is entertaining. If it is, why would you want to wait? It was very clear from your post that you were being royally entertained - you'd be nuts to turn that down in the hope that you might be even more entertained in a couple of months time. The apparent assumption that this all came along with things like Early Access and Kickstarter, does make me laugh, though. "Unplayable buggy mess" was what it said in the dictionary next to the entry for "Recently Released MMORPG" until at least the mid-200s. Anyone remember Anarchy Online at launch? Or Horizons? Even by the end of the decade we still had full price, subscription model AAA disasters like the original FFXIV. And as for adding the content in ahead of the rising player bubble as it drifted up the level range, I vividly remember poking around the Level 30+ areas of Dark Age of Camelot a few weeks after launch to find unpopulated maps still waiting for the desperate develeopers to finish adding the quests and mobs. A decade later, GW2 launched with much of the content for the last twenty levels broken and unfinished. It was weeks before many of the events in Orr worked properly - months for some. I quite like Bioware games and I quite like RPG / shooter hybrids (for example Destiny and Borderlands are both great fun imo). In theory I'm part of the target market for Anthem. But I'm still on an older MMO kick, and my spare time schedule doesn't have any room in it right now. Regardless, I don't think narrative, such as we have, in older MMOs is going anywhere. DDO is my latest fix, and the stories being told there have only gotten stronger recently. There is also a ton of older stuff with narratives I have yet to see. As long as they keep the lights on long enough I can't see how I would run out of "new to me" things to try. I played FFXI for more than half a year and saw maybe 40% or the main story, played less than 1/4 of the classes, and saw maybe 10% of the rest of the content (e.g., I never decorated my house at all..it was still one bare room with a moogle in it). I've still never played GW (one or two), and both are rumored to be pretty good. I've seen less than half of TSW and EQ II. I've only played STO for maybe an afternoon. The list goes on and on. I'm with you on all of that. There's already more than enough for most of us and I have no doubt that various styles of older-school MMORPGs will continue to be made - just not by any of the really big developers. There's a difference, though, between MMORPGs having tons of "story" in the form of endless quests and one, super-important overarching narrative that drives the entire game. I'm not sure anyone's still doing the latter except for SquareEnix, are they? I know that the Living Story in GW2, for example, even though ANet milk it for publicity, is largely ignored by many (possibly most) players, except when there's some unlock gated behind something, as was the case with Mounts. Maybe SW:tOR players still take the narrative seriously? I don't know, never having played. I get the impression the storyline in WoW is very much secondary to the mechanics when an expansion comes out, although Blizzard are smart about exploiting story for publicity in the run-up to expansion launches. And the way you expressed your dislike for typical Bioware staples such as companions in this post is too funny. Kind of makes me wish all the more that you'd give SWTOR a try one of these days, just to see the blog post about it afterwards and find out whether it's a companion or a decision point that drives you up the wall first (cruel, I know... but it sounds like it would be entertaining). Speaking as someone who plays video games entirely for the story, with all other concerns secondary, I'm not sure I see a particular trend of moving away from narrative industry-wide. Blizzard seems to have given up on it, and it does seem like the biggest names (like Fortnite) tend to neglect narrative, but I can't say I'm feeling any particular shortage of narrative-focused games. I'm especially confused by the conflation of MMO-lite games like Anthem with a move away from story. If anything I'd say the opposite is true. The Division, for instance, had significantly more lore and narrative focus than most of the traditional MMORPGs that I've played. That's a low bar to clear, to be sure, but still. From what I've played of it, Destiny also has quite a lot of story. Whether or not that story is any good or not is debatable, but it's there, and again, it's much more of a focus than it ever was in the large majority of MMORPGs. Even in Anthem's case, while it doesn't seem quite as story rich as past Bioware games, it still seems as though story is going to be a big part of it, and one game doesn't make a trend for Bioware. Andromeda and Inquisition had a lot of filler grind content, but that didn't make for less story. There was just more of everything else. I'd have rather not had the grind, but again I can't say I was in any way short-changed as a story fan. Story is a very slippery term. I try and keep "narrative", "story", and "storyline" as separate terms when I'm writing about this stuff but they do tend to bleed over. Also "Lore" is something completely different. "Story" is also a very different proposition in single-player (or co-op) RPGs than in MMORPGs. I have only ever played one MMORPG in twenty years that unconditionally, categorically required all players to complete a central narrative and that was FFXIV. In every other MMORPG I can think of it has always been possible to opt out of the main storyline and just level up and run endgame content, be that dungeons, raids or PvP, if that's what you preferred. Many MMORPGs have some specific gating at various points but only FFXIV that I can think of ties them directly to a single narrative. In single-player RPGs, however, the game frquently, usually, *is* the main storyline. If you don't complete that you haven't finished the game. This new breed of MMOLites, as Belghast is calling them, seems to sit somewhere inbetween, with a central storyline that's fairly foregrounded but gameplay that's self-perpetuating and independent. To me it looks a bit like the worst of both worlds but I haven't actually played any of these titles other than, briefly, Warframe so I don't speak from direct experience. From my perspective, if the upshot of this trend is a clear split in the overarching genre, leaving traditional MMORPGs on one development path and MMOLites on another, that would suit me fine. MMOLites are welcome to keep the single throughline narrative that "matters". MMORPGs do better with a vague, background narrative that no-one really pays attention to.